To create a unique look for your News article, you start by defining your layout. 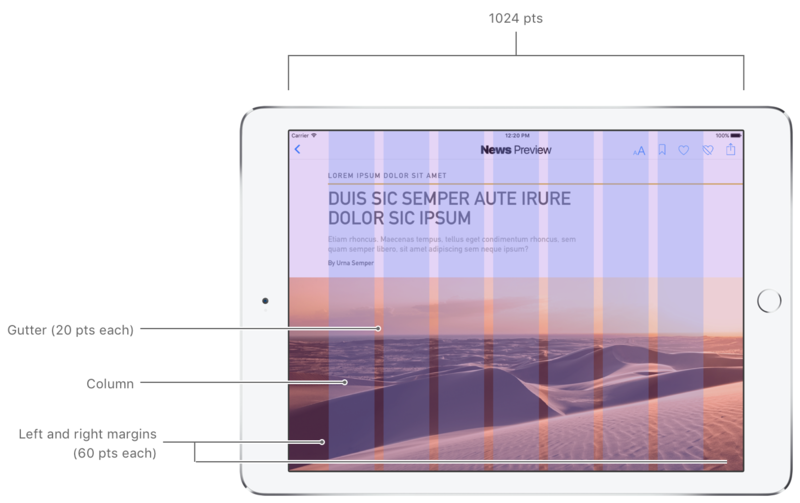 Apple News Format uses a column system that provides different horizontal locations for aligning the components in your design—your title, headings, body text, images, pull quotes, and so on. You might be familiar with column as a text formatting term, but in Apple News Format a column is used for aligning entire components, not the text within a component. The column system is a set of equal-width, vertical segments you use to align components in your layout. The number of columns you choose for your layout determines your options for positioning components. For example, a layout with one column provides only one location for alignment, so all components align to a single horizontal position at the far left. A layout with seven columns offers more flexibility. Consider the components you plan to include and their horizontal locations relative to each other. Consider how your design will look in landscape and portrait and on different-sized devices. Is your design symmetrical or asymmetrical? Do you want your images aligned to the same position as your headings and body text, or to a different position? Once you know the general horizontal placements you need, imagine overlaying equal-width columns on your design. How many equal columns do you need to get all the horizontal alignments you want for your design? Layouts with 5 to 10 columns provide enough flexibility to support most designs. 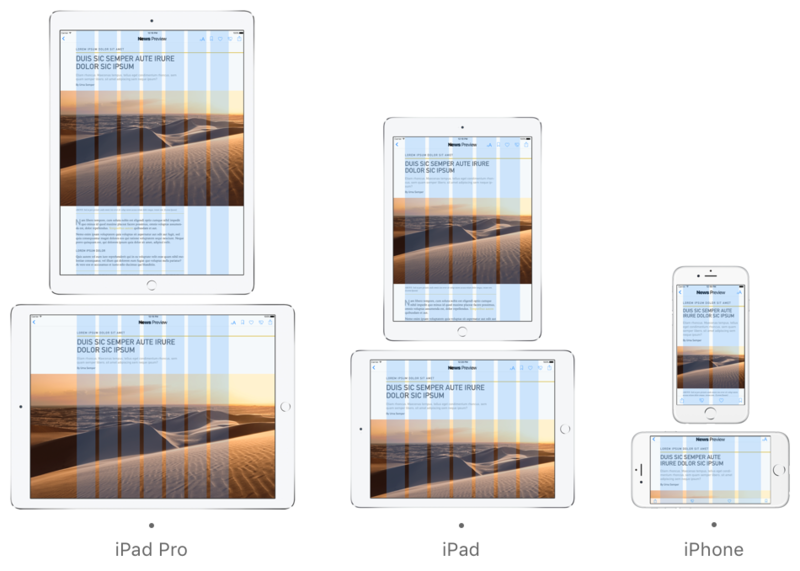 If you create a layout with fewer than 5 columns, Apple News Format may not have enough information to maintain your intended design on smaller devices. A layout with 7 columns usually provides enough layout information to resize your design for iPad and iPhone. News uses this column system when it automatically scales down your article to be read on smaller screens. It takes the number of columns you specified for your layout along with the width of your article to determine an optimal column width. Then, on smaller devices, it automatically uses fewer columns. Consider the following figures. The first figure shows an article on three different devices. The blue areas indicate columns. In this example, there are 10 columns on the iPad Pro, 7 on the iPad in portrait, 6 on the iPhone in landscape, and 3 on the iPhone in portrait. The News app does not scale up. The number of columns decreases on narrower displays, but will never increase. In the previous figure, the layout with 7 columns that was designed for the iPad in landscape still has 7 columns on the iPad Pro—even though the iPad Pro has an extra 300 points in landscape. News will not increase the number of columns, but will increase the margins on the left and right sides. The width of the gutter between columns remains fixed. columns. Default: 7. Number of columns in the article. width. Default: 1024 pts. Width the article is designed for in points (iPad and landscape). margin. Default: 60 pts each. Size of the left and right margin in points. gutter. Default: 20 pts. Gutter width in points. The following figure shows an article that uses the default values. With 7 columns and a 60-point margin on each side, this layout offers flexibility for a variety of designs and will easily scale down to iPhones. Your next step is to position each component. See Positioning the Content in Your Article. Position a caption in the wide right margin of your article. Create a box with an HTML bulleted list in the margin.